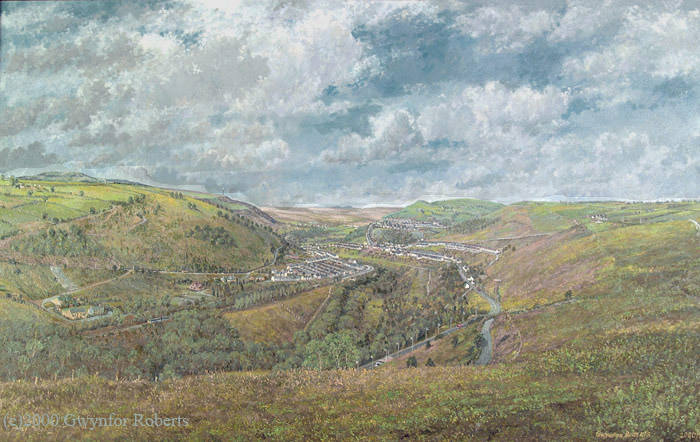 This is a view from Aberbargoed which looks North through the valley. Brithdir is down on the left with Coed y Moeth common on the right, leading on to Pen Cwarrau Farm and down into New Tredegar and Tir_phil. Phillipstown can also be seen high up on the mountain. Pontlottyn and Rhymney are at the top of the valley and finally, The Brecon Beacons are visible in the distance. Sketches for the painting can be seen below. Here's a nice mail I received from a lady. Have a read if you have a moment. I bought a larger version of this print for my father about 10 years ago. His name was Ivor Davis, known as Maynard as he had an Uncle Ivor. He was born in New Tredegar in 1942, near the river, but his family was resettled to Aberbargoed when their house was demolished. Despite having an inside bathroom and his own bedroom, his heart remained in New Tredegar. He spent 6 months down the pit before his mother didn't want that for her youngest so they moved to Manchester when Dad was about 16, following their other children. After army, marriage and 2 kids he and Mum moved to Telford. He finally passed his driving test when I was 16 - as soon as he could he took me to New Tredegar. I remember walking on the football pitch at the top of the mountain - no view as it was raining of course, in August! Dad was one of the rare Welsh kids who preferred playing football to rugby, even having trials with Manchester City. With the name Davis, not Davies, we used to accuse him of being a secret Englishman! By complete co-incidence, in 2001 I was relocated to Crumlin (Pot Noodle) - this spot was on Dad's "army route" when he was a kid! He loved an excuse to visit me in Caerphilly, especially taking his grandkids to visit the site of his old home. It was at that time a bought the print. When they were kids, Dad and his older brother, Uncle Emlyn, used to sit on a rock on the mountainside, just down from the football pitch, and put the world to rights. It was only natural that we scattered my uncle's ashes there in 1997. This made the place even more special. Dad died in 2009 - of course we took him back home. The day was extra special as his 3 grandkids, then aged 5 to 11, my brother and I had a great kick-about on the football pitch. When I gave Dad the print as a Christmas gift it was one of the few occasions I ever saw him emotional and lost for words. This is why I am telling you his story - it feels important that you know the man a little to understand the impact it had on his life - it hung above his chair until he died, so he could look at it every time he sat down. It's still there for mum, and I always give it a nod when I visit. My cousin, Uncle Emlyn's daughter, has just been widowed and is spending Christmas with Mum and I. I have ordered the print for her - I am fully expecting a similar reaction. I thank you for this impact on my father's life, and in advance for the impact on my cousin's life. 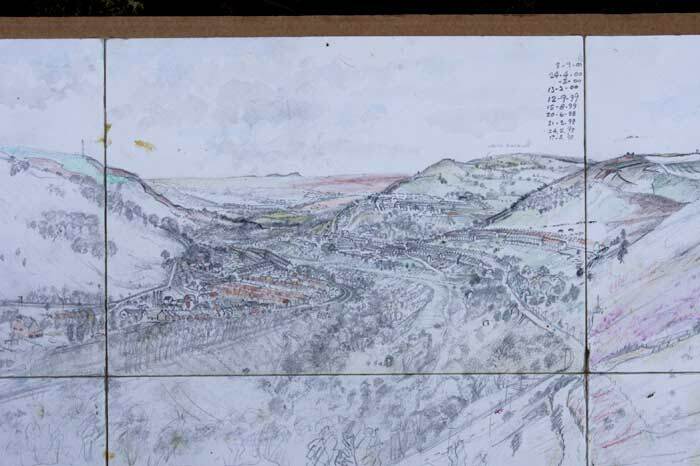 The painting of New Tredegar took 16 weeks of sketching (day job through the week) and going there on the weekends. Then popping back up checking the topography to make sure the painting was right. Nice to know it was all worth it. You timed your email perfectly -- I got the print yesterday (Monday) -- it is beautiful and you did a great job of packing it (took me ages to get at the print!!!). Thank you for the postage refund and thank you for the print. I am sure my dad will love it. "Thank you very much for doing that once again so quickly. This is the third time now we've bought pictures for my mum and dad... you capture chapters of people's lives very well! Many thanks and have a Merry Christmas"
If you care to leave a comment or if you have any information/history relevent to a painting please email it to me and I will add it to the paintings page for all to read. The details below shows the sketches for the main oil painting above. It consists of six A4 sheets of paper.